Ah, summertime. If you are a foodie, summertime brings so many food joys—fresh, ripe strawberries, juicy blueberries, crunchy asparagus. There are many food delights that are available in summer that aren’t available for most of the country for most of the year. Sure, you can buy strawberries shipped in from a foreign country in January, but they are often devoid of taste and don’t taste nearly as good as those you can buy in June near your home. Since there are likely farmers in your area who grow the seasonal produce you crave, why not take a trip out to the farm to pick some of the produce on your own? Taking such a trip is a great way to spend time together as a family, plus you benefit both nutritionally and financially. Not only will you get to enjoy produce at the peak of ripeness, but you will also likely save substantially by buying at the farm. An added bonus is that your kids will more likely enjoy eating the produce and learning how it grows. We recently went as a family to an organic strawberry farm near our home. None of us had ever picked strawberries before, and we didn’t know that strawberries got there name from the straw surrounding the berries so they don’t sit on the ground but the straw instead. We picked 7.5 pounds, bought 10 pounds and bought another 27 pounds of seconds (berries not pretty enough to sell for the full asking price). We spent approximately $91 for our haul (about $2.00 a pound which is a great price for organic strawberries), and froze 4 large bags of strawberries and made 21 pints of jam. 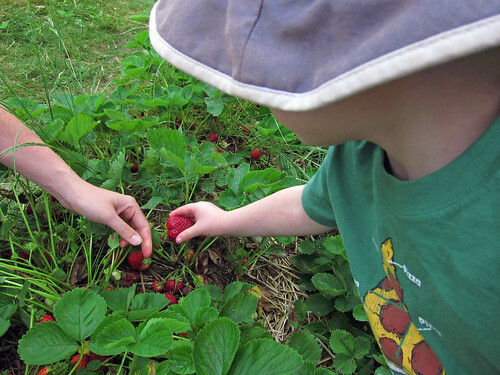 The kids still talk about the experience, and now they are more educated about how strawberries grow (as are we). If you would like to look for a farm in your area, try localharvest.org for organic farmers or farmvisit.com. If you use farmvisit.com, you can choose between organic and conventional farmers. Call the farm ahead of time. The farmer can let you know picking conditions as well as when the busiest times are and the quietest times. We always try to plan our visits around the quiet times because it is easier with small kids. Bring your own containers. Farmers may have large containers for you to take your produce home in, but you will usually have to pay for them. Bring your own containers instead and save the money. Use cardboard boxes or even large pots and pans. Bring plenty of water and sunscreen. Picking produce makes you hot, so bring plenty of water as well as sunscreen to prevent a burn. Bring a lunch. If you will be picking for awhile or will have a drive a distance to get out to the farm, bring your lunch with you so you can have a picnic or eat while traveling. Wear appropriate shoes and clothes. Tennis shoes are usually best, and wear sloppy clothes because you will probably get dirty. Have a plan for what to do with your produce. Decide ahead of time if you will only pick enough to eat right away or if you plan to preserve some of it by freezing or canning it. If you are canning it, going to the farm is just the first step to a long (but worthwhile) day of picking and preserving. A trip to the farm can be a great experience for your kids and save you money on fresh produce picked at the peak of ripeness. If you go a step further and freeze or can some of the produce you pick, you can enjoy local fruit at a great price all year long, straight from your stockpile. we are a part of a csa, but im hoping this year that i’ll be able to find a farm to get some tomatoes at in bulk to make some more salsa with. Last year I couldnt keep enough of it made, and I’d really like to do more this year. Jeff–What recipe did you use for the salsa? I’d like to make my own too. We don’t have farms accesible that I’m aware of, but my wife is going to start going to the farmers market which I think is a pretty good compromise, as it brings the farms closer to us. I don’t have a farm around here but I have a farmer’s market. Union Square has the best one in the country if you ask me. That’s because they seem to truly care about their produce by the looks of what they bring.